Do You Really Need Vitamin and Mineral Supplements for Good Health? Home > Health > Do You Really Need Vitamin and Mineral Supplements for Good Health? Do you take vitamin and mineral supplements daily to keep you going when tired or rundown? Or do you take supplements to feel better physically or to improve your appearance? These are the reasons why people take dietary supplements according to a survey conducted by the Food and Nutrition Research Institute, Department of Science and Technology (FNRI-DOST). The survey also revealed that the most common supplements taken by consumers are multivitamins and minerals, B-complex vitamins and vitamin C.
Dietary supplements are becoming very popular nowadays and a significant percentage of the population is taking them. A trip to the local health food store will reveal different combinations of vitamin and mineral supplements one would ever imagine. People get attracted by the health claims of manufacturers that sometimes they substitute these supplements to healthy diet. Experts say this is dangerous because there are possible risks of direct toxicity of high doses of vitamins and minerals. The more common symptoms or side effects are nausea, vomiting, headache or diarrhea. They said further that taking vitamin and mineral supplements without professional advice could lead to the potential danger of nutrient interactions. For instance, giving high dose calcium could inhibit iron absorption. Studies conducted abroad showed that when varying doses of calcium have been added to a meal containing iron, nonheme iron absorption was decreased. Researchers postulated that there is a complex mechanism that takes place in the lumen, wherein calcium interferes with iron absorption. Another example of an interactive effect is that of iron and zinc. A high intake of iron may deplete zinc absorption, or vice versa. These nutrients, together with other metals like cobalt, nickel, manganese, and zinc share in part the same metabolic pathway. In order to maximize the absorption of these nutrients, they have to be consumed in the proper ratio, otherwise, either one nutrient is utilized or the other one is wasted. 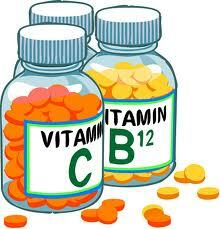 These are times when vitamin and mineral supplements are necessary. One reason is to augment an inadequate diet to prevent or correct a specific nutritional deficiency. For example, iron supplementation may be helpful in a patient with iron deficiency anemia or folic acid supplementation maybe recommended to pregnant women to reduce the risk of bearing children with neural tube defects. Another use of dietary supplements is pharmacological, where dose above the Recommended Dietary Allowance (RDA) are used for a specific pharmacological effect, rather than to make up for any deficit in dietary intake. For instance, patients with acute infection or burns need increased energy and micronutrients for fast recovery, but their weak bodies prevent them from absorbing the required nutrients from a normal diet. The best strategy for promoting optimal health and reducing the risk of chronic diseases, according to the FNRI-DOST, is to choose wisely from a wide variety of foods. There are tools like “Recommended Dietary Allowances”, “Your Guide to Good Nutrition”, “Food Exchange List”, and “Food Composition Table”, among others, available at the Institute at Bicutan, Taguig, Metro Manila to help you plan a balance diet without excessive intakes of nutrients. For more information, contact the Food and Nutrition Research Institute at telephone number 837-20-71 local 2287 or 2299.